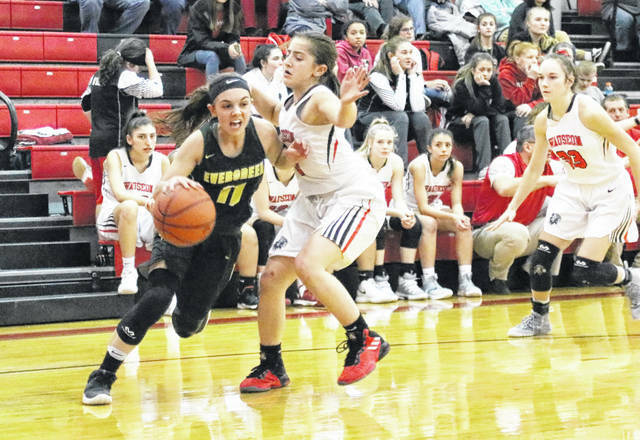 Savannah VanOstrand of Evergreen (4) works the ball up the court as Sam Aeschliman defends for Wauseon. The Vikings fell to the Indians Thursday, then defeated Fayette two days later 53-49. Mady Peluso of Evergreen drives baseline during a game at Wauseon Thursday. Aeschliman led everybody with 11 points in the win. Peluso paced Evergreen with 9 points. Down 11-2 early and looking totally sick on offense against Fayette, Evergreen needed a shot of instant cure. Kennedi Keifer gave the Vikings just that, hitting three of her five triples in the first quarter to get her team back in the game, and the Vikings went on to beat the Eagles 53-49 Saturday at Evergreen. The Vikings committed four turnovers and missed three easy ones at the rim early on. In the next three minutes, the junior guard canned three straight from long range before Kelsie Komisarek’s steal and score knotted the game at 13-13 after one. Robinson and Trista Fruchey each scored off the offensive glass to reclaim a 17-13 Fayette lead, but Keifer’s fourth three-ball of the half re-tied the score. The Vikings held a 26-22 advantage at the half. In the third, a quick Viking burst headed by VanOstrand’s putback and Mady Peluso’s basket gave Evergreen a 37-28 lead, before heading into the fourth up 39-33. Addyson Bentley hit a pair from the line, then on a fourth try off the offensive boards, got one to fall to make it 39-37. After Ruger split a pair from the stripe, Fruchey put Fayette ahead with 5:32 left with a move inside at 40-39. 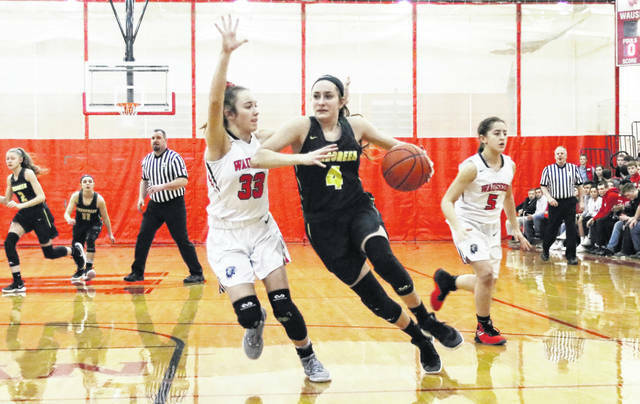 The two squads continued to go back and forth and after the Vikings missed at the foul line, Rufenacht knocked down a triple from the top of the key to put the Eagles up 46-45 at the 2:04 mark. Nicole Brand gave Evergreen the lead back, hitting two free throws with 1:47 left. A Peluso wide open three-ball put Evergreen up two possessions, 50-46, and they would hold on from there. Evergreen is at Patrick Henry Tuesday, hosts Archbold Thursday before traveling to Ottawa Hills on Saturday.